When buying windows for your home, you have a choice between two different types of windows: new-construction windows and replacement windows. Except in a couple of rare instances, these windows are mutually exclusive. What is the difference between the two categories of windows and what are the installations that govern using one window over the other window? Definition New-construction windows are meant for clear openings in the house usually with no trim or siding in place. Replacement windows replace existing new-construction or replacement windows. How to Identify New-construction windows have nailing or attachment fins, or flanges, on the exterior side of the window. Replacement windows have no nailing fins or flanges. They are smooth-sided for easy insertion. Do-It-Yourself New-construction windows are moderately easy to install (though much of the peripheral work is difficult). Replacement windows can be tricky for do-it-yourselfers to install due to exacting tolerances. Availability New-construction windows are easily available and in stock at most home centers. Replacement windows are difficult for do-it-yourselfers to obtain, though there are a number of online sources. Where to Use Use new-construction windows when building new structures or for repairing badly damaged existing structures. Use replacement windows when the structure has an existing window and the peripheral area is in good shape. Performance New-construction windows are absolutely weather-tight when installed correctly. Replacement windows are weather-tight, as well, though the absence of the nailing fins is not a positive feature. Cross-Over The only time you may need to use new-construction windows in a replacement window situation is when the wall and frame are badly deteriorated. There is almost never a need to use a replacement window in a new-construction situation. Building a new house is the ultimate example of new construction. There is never a need to use replacement windows since no windows are being replaced. All new homes use new-construction windows. Building an addition is a smaller version of building a new house. 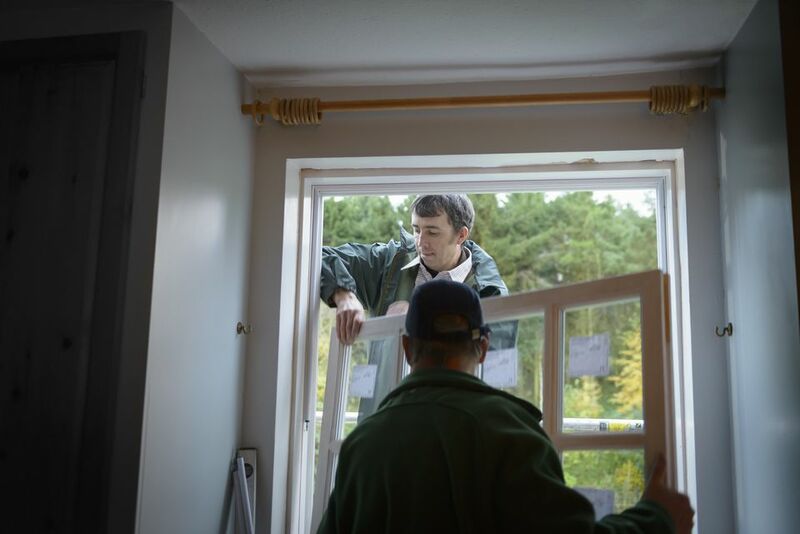 Unless you are dealing with a very unusual circumstance (for example, incorporating a portion of an existing wall into your addition), you will almost always use a new-construction window. When the window is in bad shape, it almost always follows that the peripheral area is in bad shape. The framing around the window, exterior siding, interior drywall, wall studs, and even floor covering and subflooring may have been compromised by termites, rot, or carpenter ants. Because you will need to perform extensive carpentry work, it will be just as simple, easy, and cheap to install a new-construction window as it is to put in a replacement window. A new-construction window will be more substantial and will provide better insulation from the elements than a replacement window. Because of the attached nailing fins, it will be more weather-tight than a replacement windows. Installing a new-construction window in a good wall will create more damage and work for you than installing a replacement window. Window, wall, trim, and siding elements are all connected; when you alter one element, you alter other elements. The great value in using replacement windows is that they are designed to slide in horizontally while replacing a minimum of other elements. Usually replacement windows do require the removal of interior trim. However, as long as the trim is carefully removed, it can usually be replaced on a one-for-one basis. Some painting is usually required, though. If new-construction windows have molded fins and replacement windows do not, does it stand to reason that you can remove the attached fins on the former and turn them into the latter? While this is not common, in a few cases it is possible. Some brands of new-construction windows have fins that are designed to be snapped or cut off. This provides the greatest possible utility to these windows. Generally, it is not advisable to cut off molded fins from new-construction windows that do not have purposely detachable fins. You may compromise the window's structure or break the glass in the sash while cutting. Also, it can be difficult to smooth down the outer edges of the window enough for the window to tightly slide into place and remain weather-tight.